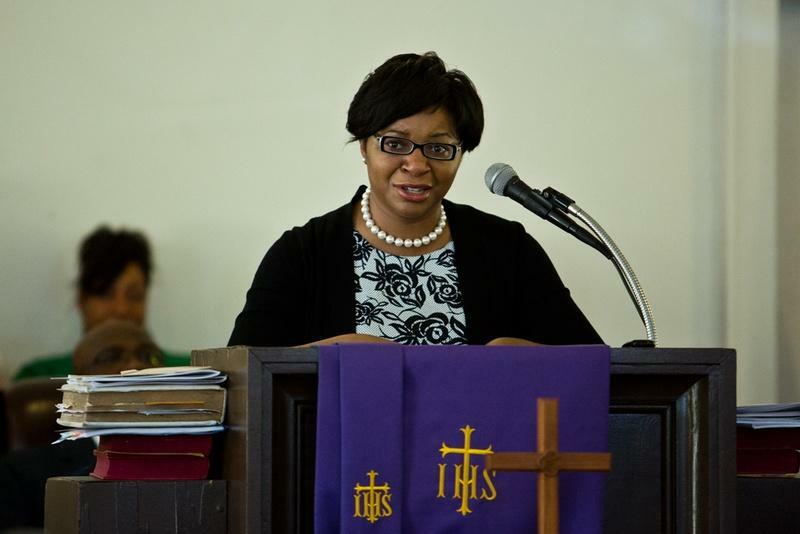 Sharon Cooper speaks at the memorial for her sister, Sandra Bland, at Hope AME Church in Prairie View, Texas, on July 19, 2015. Sharon Cooper, who traveled to Texas for the service, bade her younger sister goodbye when she left for a job at Prairie View A&M hoping Sandra would find welcome in Waller County. “When you send your baby sister to a place that’s far away from home, you hope that people will open their arms and embrace her,” Cooper said. Bland was found hanged on July 13 in a Waller County jail cell, her death ruled a suicide. She had been pulled over three days earlier outside the Hope AME Church by a Texas Department of Public Safety trooper for an improper lane change, and arrested on a charge of assaulting a public servant. Multiple agencies, including the Texas Rangers and the Federal Bureau of Investigation, have announced investigations into her death, and Waller County officials have promised they would hide no information from the Bland family. A Prairie View A&M graduate, Bland had returned to take a temporary job with the school's extension service. In the wake of her sister’s death, Cooper said her family has found support in the Waller County community. Several Texas officials, including Lt. Gov. Dan Patrick, U.S. Rep. Sheila Jackson Lee, D-Houston, and state Sen. Rodney Ellis, D-Houston, also made appearances. At Bland’s home church, located just outside of Chicago, many in the congregation knew her, taught her in the Sunday school, sang with her in the choir or participated in youth programs together. Though she had been sad to leave her sisters, friends and family said she was excited about new opportunity in Texas. They described a woman who saw greatness in everyone and was determined to see them succeed whether they were an aspiring artist or a single mother. Preston Miller and Juwan Mass, who grew up with Bland, said she demanded that her friends “aggressively pursue what they loved,” and noted she and her sisters made sure the boys at their church stayed out of trouble and avoided incarceration. “We all have college degrees, and we all have pursued our dreams to the highest degree possible,” Miller said. Church members questioned the circumstances of Bland’s death, echoing the sentiments of those who have been protesting in Texas and posting on social media. The DuPage AME Church created a petition asking the U.S. Department of Justice to begin an independent investigation of her death. At a service before the prayer walk, the Rev. James F. Miller acknowledged the racial tensions surrounding Bland’s death. In an impassioned sermon, Miller asked the congregation to honor Bland’s legacy, her activism and desire for equality. In her “Sandy Speaks” videos posted on Facebook, Bland called for action on injustices ranging from police brutality to racism. She once spent hours at a shopping mall collecting signatures for a petition to reinstate the championship title of a Chicago Little League team that investigators said used ineligible players. Roughly 200 people gathered Sunday evening on the Prairie View A&M campus to share memories of Bland and encourage the community to continue to push for answers in her death. Some students recited poems about racial oppression, and several of Bland's friends from the university spoke about the energetic young woman they remembered. "I've only seen Sandy cry twice. She was such a strong spirit, such a strong presence," said Carlesha Harrison, one of Bland's friends from the college marching band. "She had a strong faith in God, and she wouldn't let anything tear her down." Bland was passionately outspoken, her friends said, but also exceedingly kind.